It's time for a little knit-origami magic. Stay tuned for EZ Baby Sweater Week here at Brooklyn Tweed. Lovely colors -- I know it's all handspun, but it kind of reminds me of the colorscheme of Noro 86. Pretty! Looking forward to watching the magic! I will definitely stay tuned. Your Amoeba is looking really beautiful so far! Wow. Those colors aren't messing around. 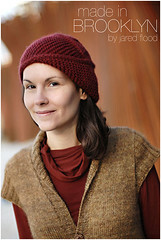 You are making a perfect thing with a perfect combination of exquisite yarns. One of the very few truly happy-making things I've seen on this wicked stupid hot day. Those colours look fabulous together. 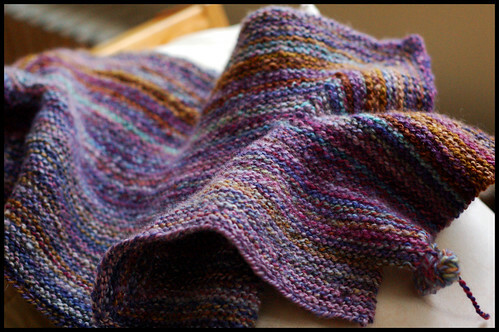 Wow, all that handspun looks fantastic in garter stitch! I am always amazed at the magic that occurs in knitting and this little sweater never ceases to surprise me no matter how many times i knit it. BSJ, here we come! It is muy purdy. If you're in Portland through the weekend, you should get down to Eugene for the Blacksheep Gathering, June 22-24. Heaps of fiber to tempt you in your new addiction. I'm about halfway through a BSJ myself. Mine is a plain vanilla version. Literally; it's knitted from Lion Brand Microspun in French Vanilla. I'm still not quite convinced it's going to turn itself into a baby jacket, though. That looks so scrumptuous, I don't even know what to say! I can't decide what is better: your knitting or your photography. Thanks for the eye candy. I can't wait to see what your BSJ looks like once complete! The pattern is so wonderful and your handspun is amazing! One lucky baby to get this, for sure! 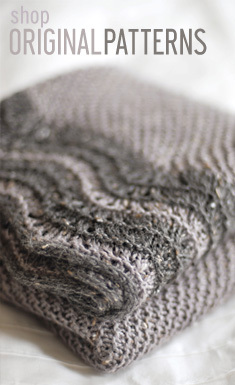 I'm completely sold on garter stitch now -- and I'll have to promise my pregnant friend that I'll hand-wash the handspun BSJ you've inspired me to knit for her. Lovely! Wow! (cough, sniff), your photos are majorly inspiring; I gotta get better fast. Beautiful colours! I have EZ's pattern sitting right beside me- just waiting for the right yarn to jump out at me. I just frogged the BSJ I was making. I am looking forward to seeing yours develop with your beautiful yarn. I'd be willing to try once again with a variegated yarn this time. Yours is outstanding. I can't wait to see it! The rich colors are just killing me.